Twrkv's "Triptych" on view for the first time in New York in 35 years. — TWRKV. In the summer of 1975, Jack Tworkov upended his Provincetown studio to accommodate plans to paint an ambitious three paneled painting. On June 15 he started work on Triptych (Q3-75 #1). Explaining his process further in his journal, Tworkov wrote, “The grounds are unusual for me—brushed on or applied with rag very diluted large swathes of primary colors—instead of the usual smoothly brushed greys. The grounds are more like the starts of paintings in the 1950s [...] How much the underpainting will affect a real change in the final outcome is what I am curious about.” This process foretells how Tworkov would begin Triptych. Triptych not only continues the gestural under-painting similar to the paintings made in the summer of 1973, but revisits the fiery palette of the most historic works by the artist from the 1950s like Duo I (1956) and Duo II (1956) (both in the Collection of the Whitney Museum of American Art) and further, West 23rd (1963) (Collection of the Museum of Modern Art). It is this dramatic orange and red gestural background, leaping from one panel to the next that is the unifying structure of Triptych. Within Triptych appear references to his early horizontal masterpiece, West 23rd (1963). Both paintings share many similarities from color palette to structured divisions in the canvases. Although West 23rd is a single paneled canvas stretching 80 inches wide, it is compositionally divided in the center—the action seemingly plays out on the left and on the right. A horizontal border in yellow-orange, runs the bottom length of West 23rd linking the left with the right. Similarly, a boarder of gestural under-paint runs horizontally along the top boarder of Triptych connecting the multiple panels. Three preliminary sketches on graph paper made earlier that spring emphasize the crucial role the preparatory drawings now play in calculating the architecture of a late Tworkov painting. Tworkov completed Triptych in one month. Riding the creative momentum, the artist began work on what would become one of his most important series of late paintings. Knight Series first began in sketches made while on a train from New York to Washington D.C. Further evolving his fascination with geometric configurations and numerical concepts, these sketches traced and then abstracted the movements made by the Knight in a game of chess. Magnified from drawing to grand scale, Knight Series #1 (Q3-75 #2) (1975) (Collection of the Cleveland Museum of Art) and Knight Series #2 (Q3-75 #3) (1975) (Collection of the Estate of Jack Tworkov) both measure 90 x 75 inches and tower over previous works by the artist. Their size and ambition were likely inspired by the completion of Triptych. Triptych has been featured in three major retrospective exhibitions of Tworkov’s work including Jack Tworkov: Paintings 1950-1978, Third Eye Centre, Glasglow; Jack Tworkov: Fifteen Years of Painting, Solomon R. Guggenheim Museum, New York, NY; and Jack Tworkov: Beyond Black Mountain College, Selected Works from 1952-1982, Asheville Art Museum, NC. Journal Entry: June 15 . Steven W. Kroeter. “An Interview with Jack Tworkov,” Art in America (November 1982), pp. 82-87. Kasha Linville Gula. “The Indian Summer of Jack Tworkov.” Art in America (September 1973). 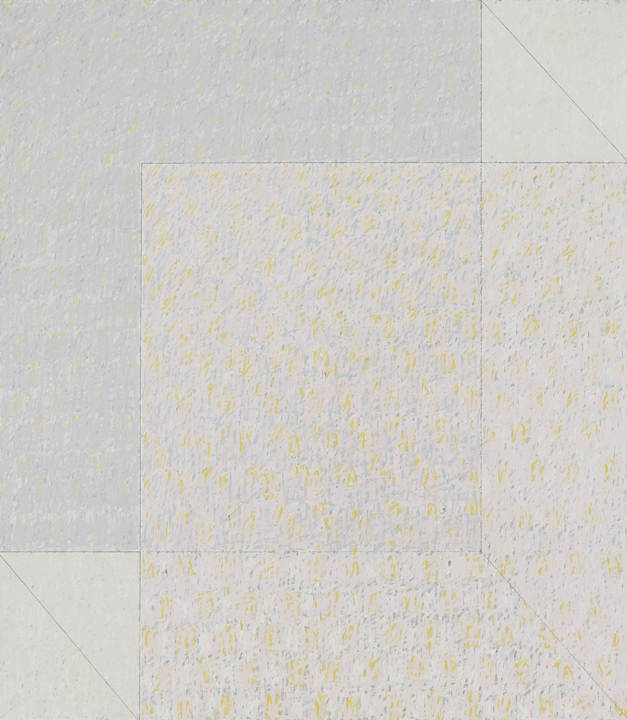 Jack Tworkov: Recent Paintings, February 5–March 14, 1971. Marcia Tucker. “Jack Tworkov: Recent Paintings,” exhibition brochure, Whitney Museum of American Art, February 5-March 14, 1970. Letter to Biala. September 24, 1974. The four paintings Tworkov finished that summer were Q4-74 #1, Q4-74 #2, Q4-74 #3, Q4-74 #4. Journal Entry: Sunday, March 2, 1975. Publication unknown, likely Topeka Daily, circa March 1976. For date of first known sketch see Tworkov’s CR1072: “34 Moves of the Knight (L. 5-21-74 #2). Journal Entry: Thursday, August 7, 1975. Jack Tworkov, Nancy Hoffman Gallery, New York, NY, November 8–December 4, 1975. John Russell. “Gallery View: Jack Tworkov at Nancy Hoffman.” The New York Times, Sunday, November 16, 1975.